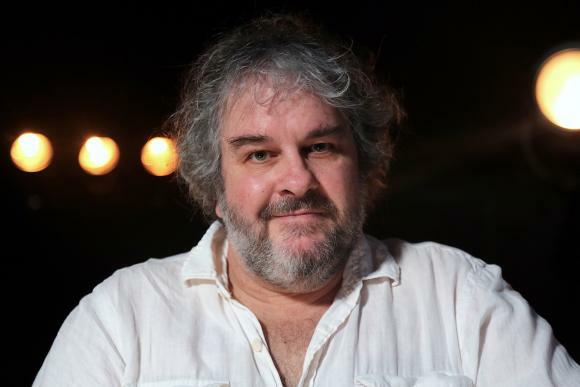 Of course you’ll have heard by now that the multi-award winning film maker Peter Jackson has been selected by to re-cut the hours of Let It Be footage and audio from the winter of 1969 into an entirely new film. We’ve been letting that huge news from last week sink in and percolate a bit – and have come to the conclusion that it’s a stroke of genius by the remaining Beatles and their Apple company. 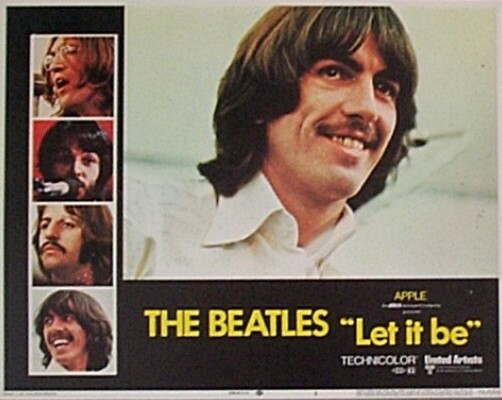 We all know that the original Let It Be film has been languishing in the vaults for years, with seemingly no chance of unanimous agreement amongst the four-headed monster that controls these things (Paul McCartney, Ringo Starr, Yoko Ono and Olivia Harrison) that a re-issue – on its own – would ever get the green light. But giving all the footage (over 55 hours of never-before-seen film and 140 hours of audio) to the Oscar-winning Jackson is something of a masterstroke. First and foremost is the fact that Peter Jackson (who made the Lord of the Rings and Hobbit movies) is a mad keen Beatle fan, and has been for decades. Secondly, his most recent project – the documentary film They Shall Not Grow Old – has seen he and his team at Park Road Post in Wellington, New Zealand, work wonders with the restoration and colorization of old photos and never-before-seen footage from World War I. The film was made to commemorate the centennial of the end of the war. The services at Park Road Post include: restoration from scanned film – scratch and splice fixes, de-noise, image sharpening, stabilizing, re-speeding and re-timing; grading – black and white and final colour grading of specialised colour created footage; and dialogue recording, Foley, and pre and final sound mixing and mastering. So they are very capable experts in their field. This all points to what should be something very special being produced. 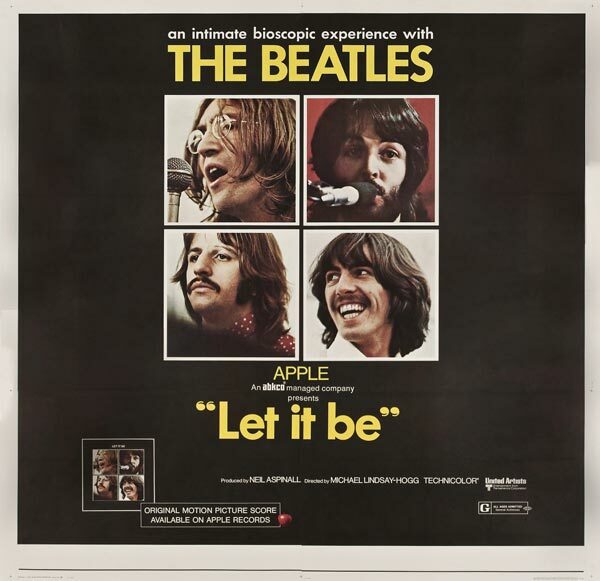 As to fans who were worried that the new film would take the place of the original Let It Be, that it would forever consigned to the Apple dustbin, well that seems not to be the case. A restored version of director Michael Lindsay-Hogg’s theatrical release is set to finally get its belated digital release “following the release of this new film”, according to Apple’s official announcement. And, it’s kind of ironic that The Beatles once tried to obtain the film rights to The Lord of the Rings….. If you laughed, you’re a Beatles fan. 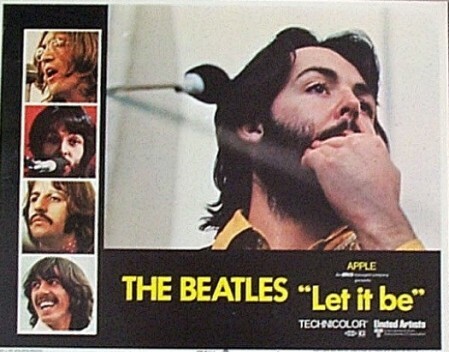 Just where the company located their Let It Be original movie posters isn’t clear, but if these were indeed genuine Let It Be posters then $19.95 was probably a good investment even back in 1985. 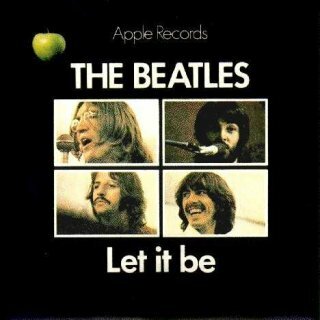 I have had in the collection for some time now a record that I thought was an original US pressing of the Beatles Let It Be. The copy I have had for oh, maybe 30 years, looked genuine enough. 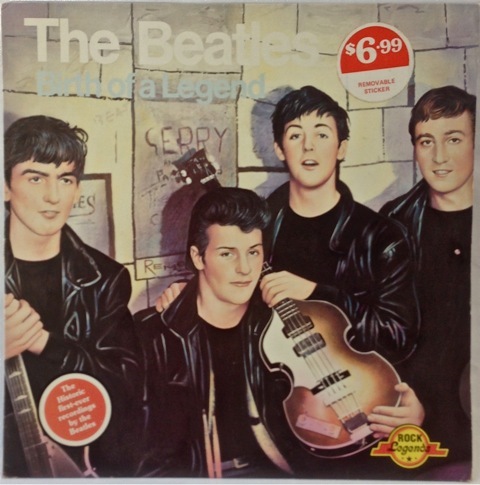 That is until I read that this is one of the most counterfeited vinyl records of all time….. When I started to look into it some more I discovered that what I had in my collection was actually a fake. 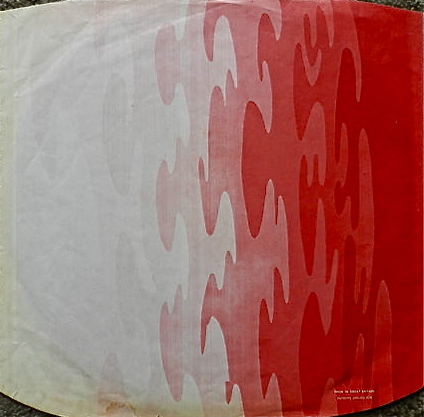 And it was only two weeks ago, after finally picking up a genuine copy at a record fair, that I could conduct a side-by-side analysis to spot the differences. Here are the tell-tale signs. 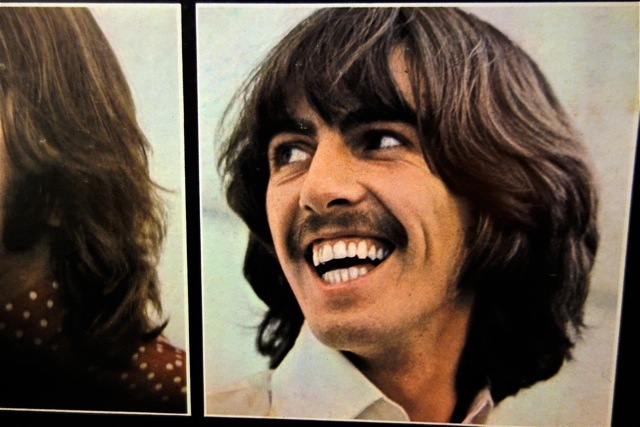 As you can see the skin tones on the photo of George Harrison are much more grainy on the fake. Also notice the white borders around each photo. They are much thicker on the counterfeit. The counterfeit label lacks vibrancy. It is washed out and dull. 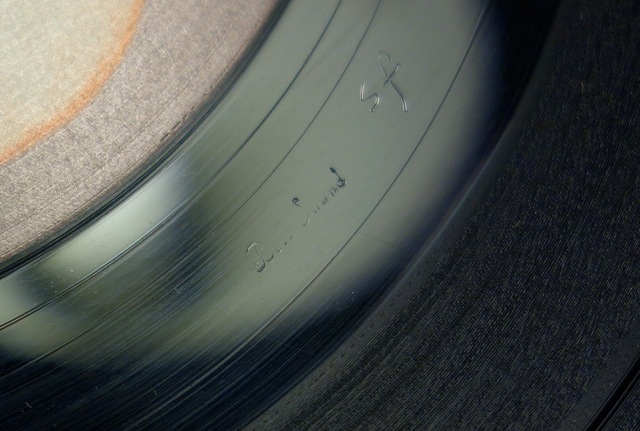 Genuine Let It Be pressings with the red Apple were mastered at Bell Sound by a guy named Sam Feldman and that’s why you can see his initials “sf” scratched into the vinyl above. Fakes don’t have that Bell Sound stamp, but the people who made the illegal copies did try to imitate the originals by including the “sf” initials too. 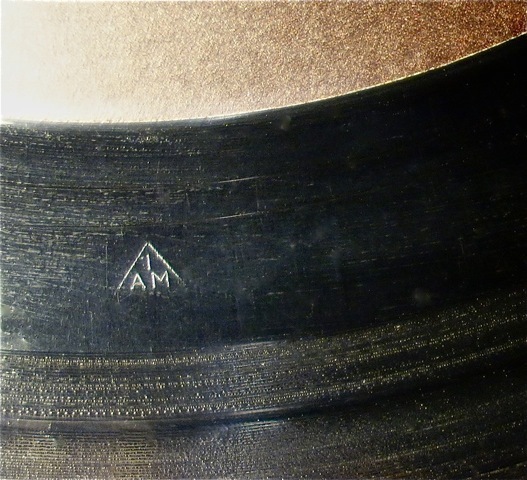 (By the way, the “IAM” in the triangle stands for the International Association of Machinists Union whose workers ran the pressing plants). 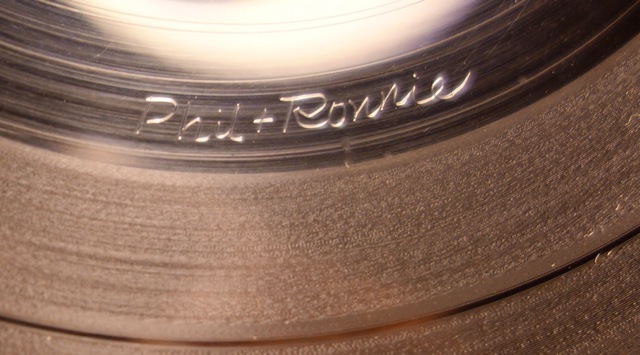 Non-legitimate copies also have “Phil + Ronnie” scratched in the play-out area of the disc but the writing is much smaller. So thats it. 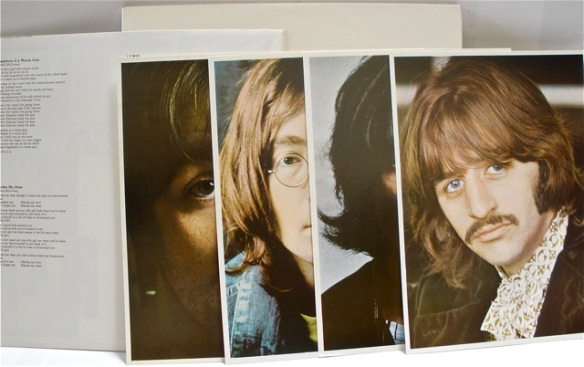 Your guide to real and fake copies of Let It Be. 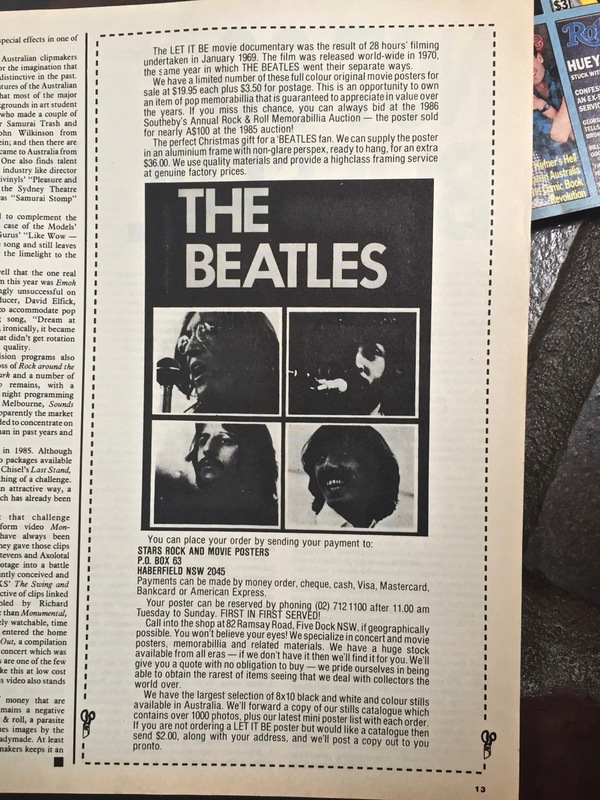 In my previous post I was bemoaning the scenario where you make the effort to get out and about early on a Saturday morning on the hunt for Beatles vinyl – and return frustrated and empty-handed. 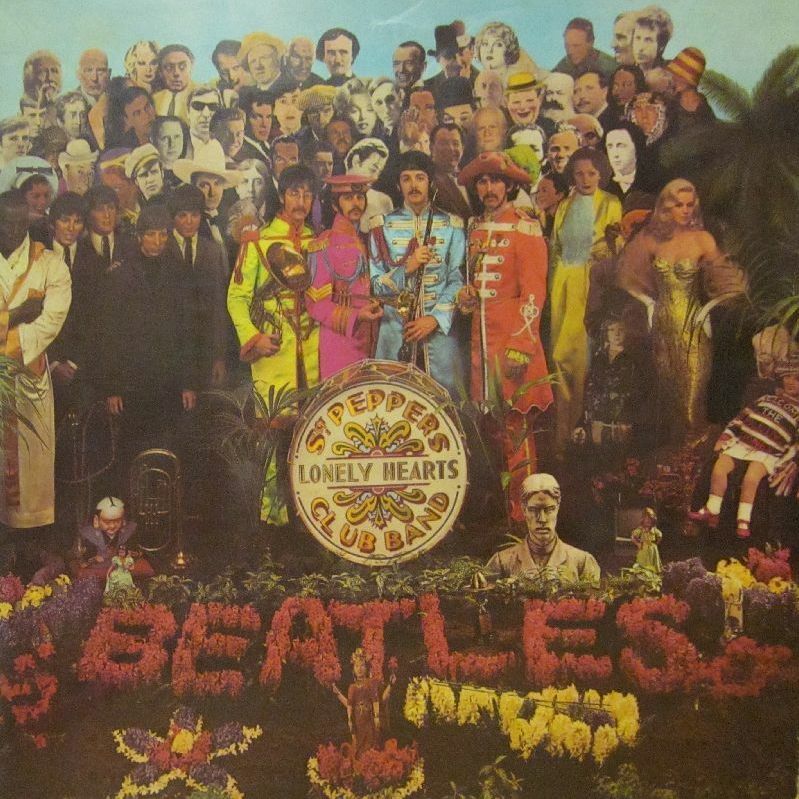 Not so this last weekend which produced a wealth of great Beatles treasure, including one LP I’d not seen before. My son has taken to joining me on these forays into others people’s garages and front lawns. He calls it “crate digging“. He’s on the lookout for jazz plus wide range of other artists he might be able to take samples from to load into his computer. He then uses short grabs from these to mix into new songs he’s creating himself. Anyway, we go to this one house early Saturday morning and the lady says yes, she has some records, but as she hasn’t gone through them she doesn’t want to put them out right now. If we could come back after lunchtime she’d find them (somewhere up the back of a very packed garage) and we could have a private look through to see if there is anything we want. We like the sound of an exclusive “crate dig” and so return at the appointed time. 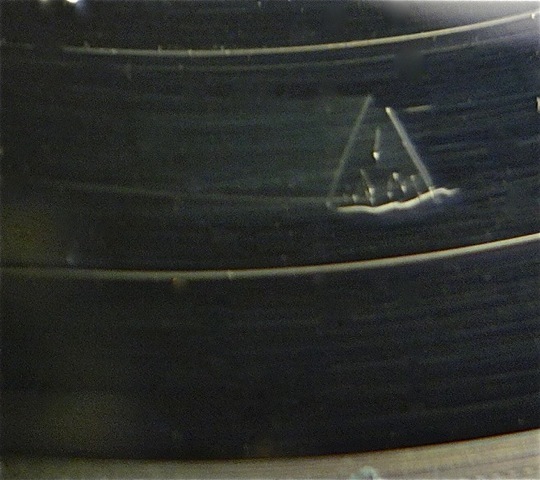 By this time four very large plastic bins filled with records have been located and we begin to look through…. 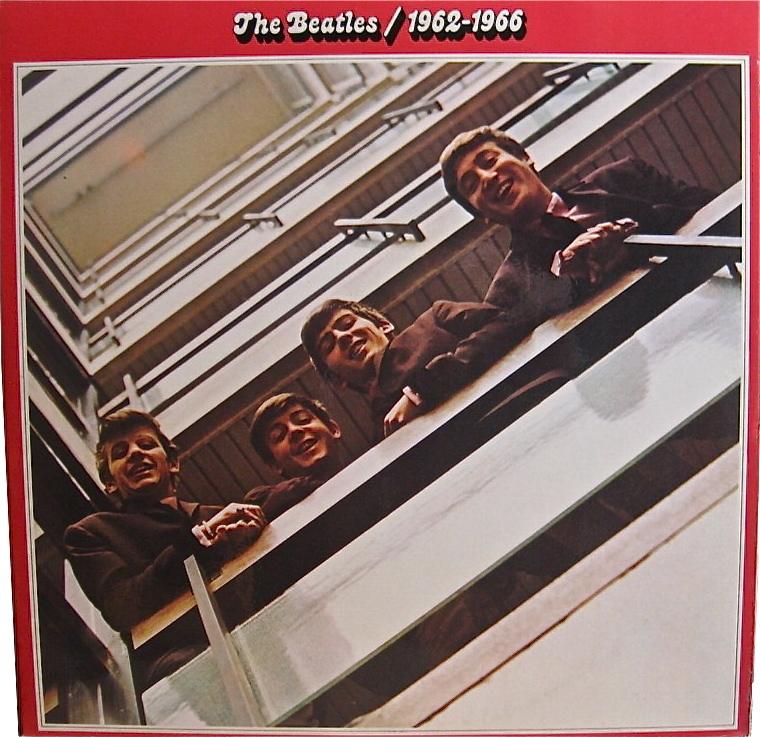 Further digging then reveals a red The Beatles/1962-1966, again an Australian copy, with the Apple label and a red background. 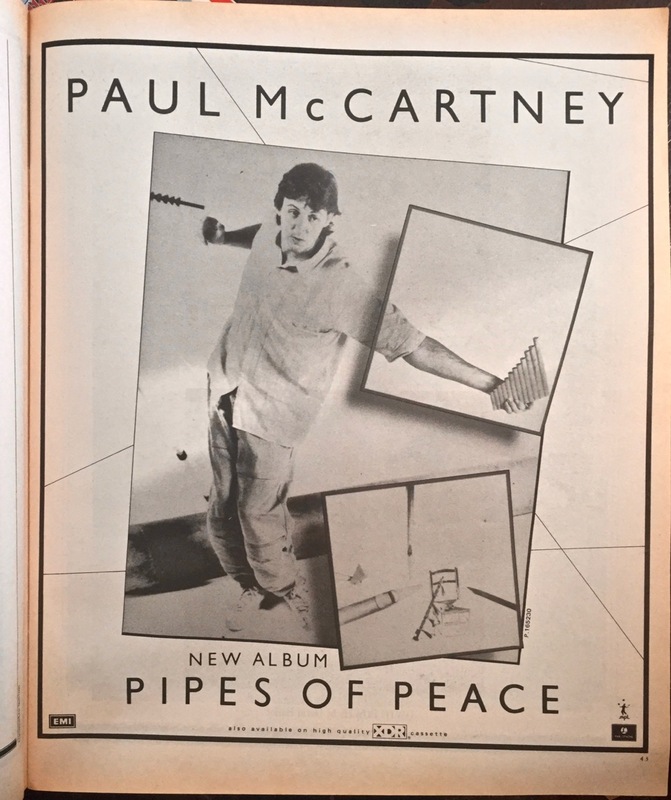 It has both lyric sheet inserts and is in reasonable condition. Not mint, but OK: The final Beatles treasure to come out of these crates is a bit of a rarity. 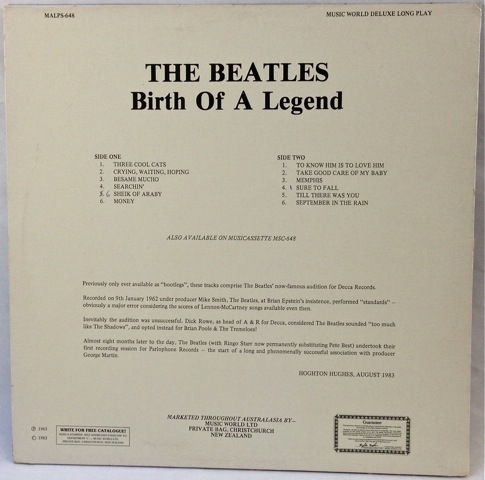 It’s an album I’ve not seen before The Beatles – Birth of Legend. 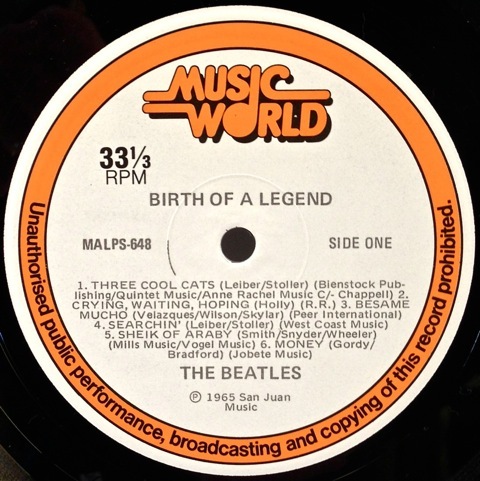 A New Zealand release from 1983 on the budget Music World Records, it features twelve songs from the famous Decca audition tapes: As the liner notes on the rear cover say, the Decca audition refers to the now-famous audition by the Beatles for Decca Records before they reached international stardom. In what was considered one of the biggest mistakes in the music business ever, Decca decided to reject the band selecting instead a band called Brian Poole and the Tremeloes. So, after a weekend before of nothing, this time around it is a different story. 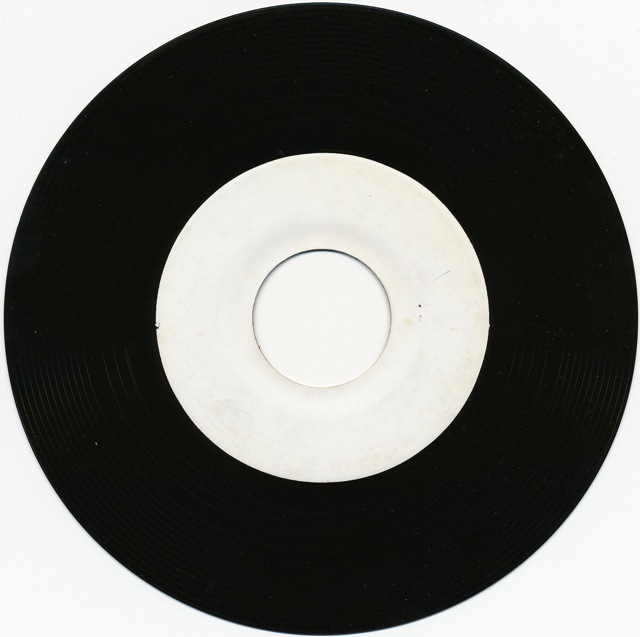 It’s a one-sided 45rpm single with three tracks on the A side. 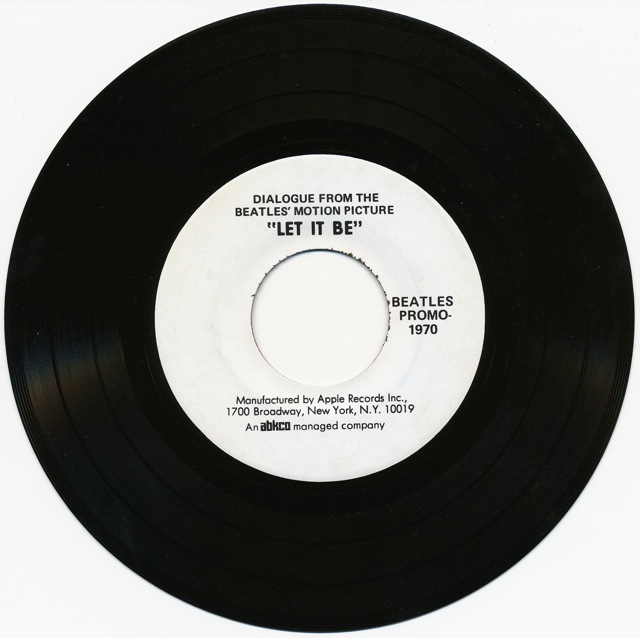 These are as the label describes – three brief extracts of dialogue from the Beatles’ 1970 film Let It Be, which premiered in New York in May that year. We’ve been looking around on the internet for some further information on it. Fab 4 Collectables (which is a really interesting site by the way) says that this disc was issued to fan club members, but as it states on the the label “Beatles Promo – 1970” you’d have to think it’s more likely a disc that was sent to radio stations to promote the Let It Be film which had only just been released in the United States. The dialogue was produced during the ill-fated recording and filming of the film in Twickenham studios in London in January, 1969. 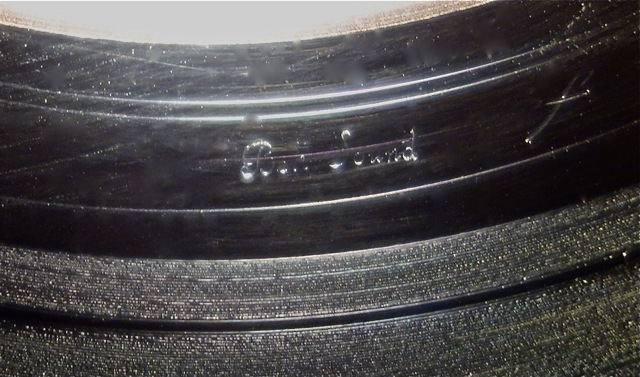 The Apple By The Numbers site (no longer active) said that there are bootleg copies of this around: “….fakes exist which do not have machine stamped symbols in the matrix area of the run-out grooves. The original was on black vinyl. Fakes exist on colored vinyl. 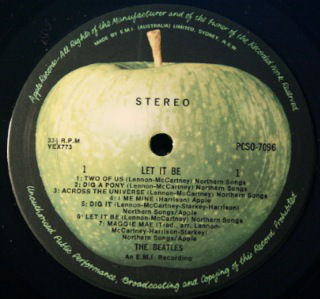 This record was made at Bell Sound Studios to promote the release of the Let It Be film documentary”. 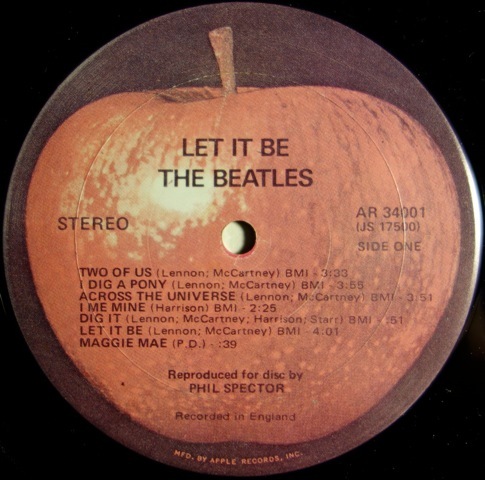 It was Bell Sound that pressed the official Let It Be LP for Apple Records in the USA. This promo 45 here has symbols stamped in the run-out area, so I guess it could be an original. It says: “Promo 1970 . D – 1” then a symbol that looks like a circle within a circle, followed by a squiggle that looks like this: ˜ (all hand-written). 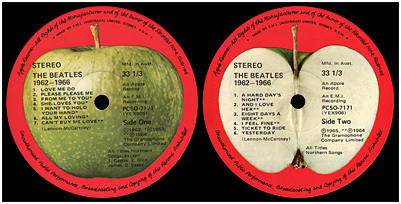 As you can see, Apple is mentioned on the label, as is ABKCO, Allen Klein’s company which was managing the Beatles at the time. If anyone has any further information on this disc please leave a comment. 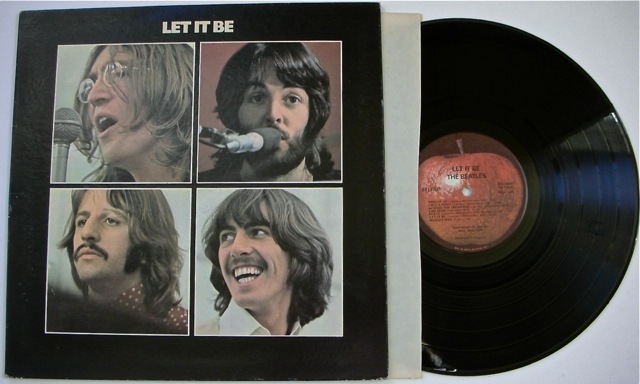 For other Let It Be posts see Label Variations – Part 2 ; Let It Be At 40 ; and At Last – A Genuine US “Let It Be” LP. Let It Be turned 40 last weekend. 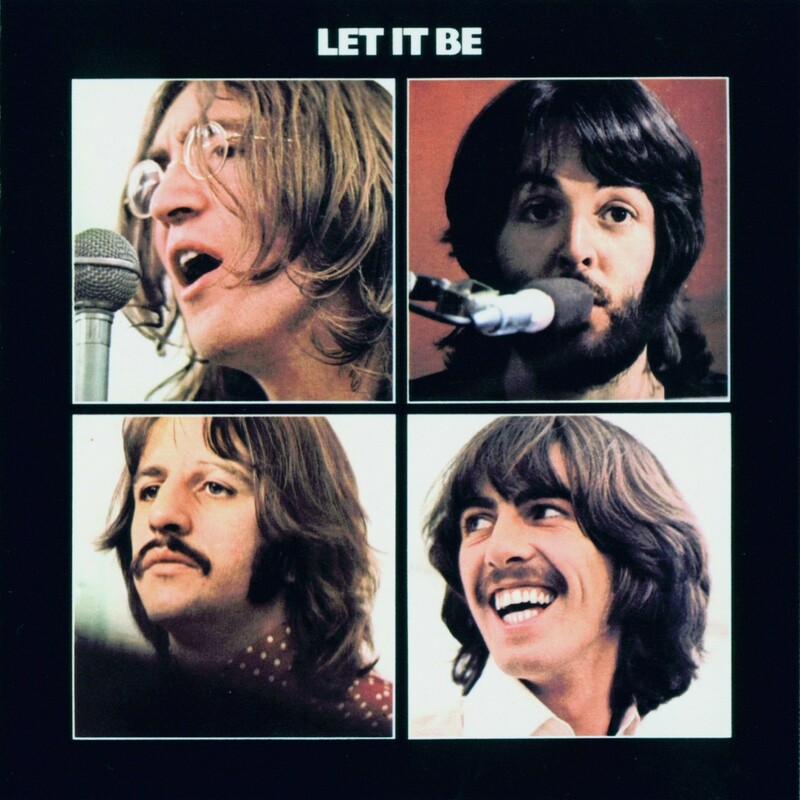 Let It Be was the twelfth and final studio album released by The Beatles. 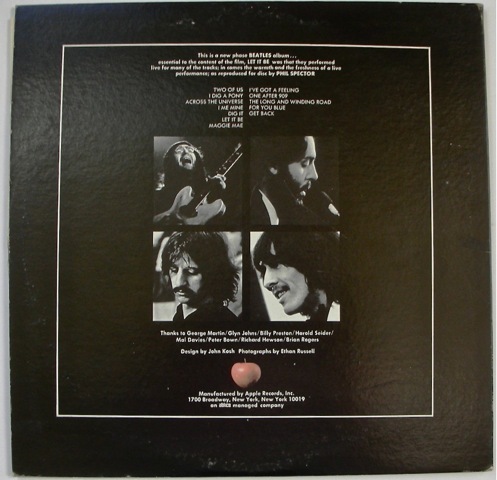 It was released on 8 May, 1970 by the band’s Apple Records label shortly after the group’s announced breakup. 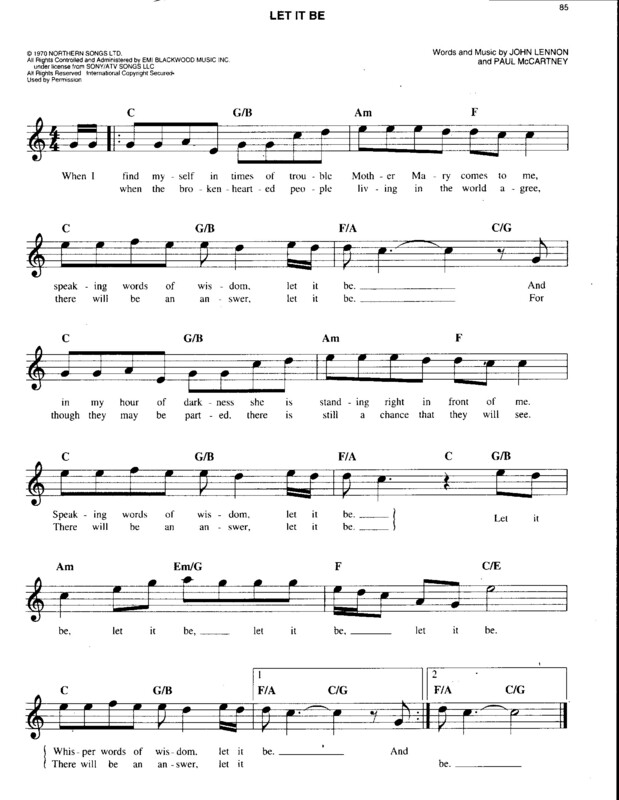 Most of Let It Be was recorded in January 1969, before the recording and release of the album Abbey Road. 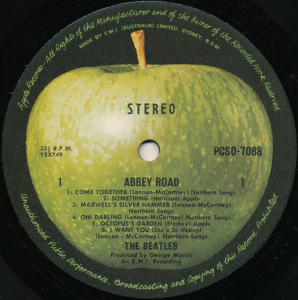 For this reason some critics and fans, such as Mark Lewisohn, argue that Abbey Road should be considered the group’s final album and Let It Be the penultimate. 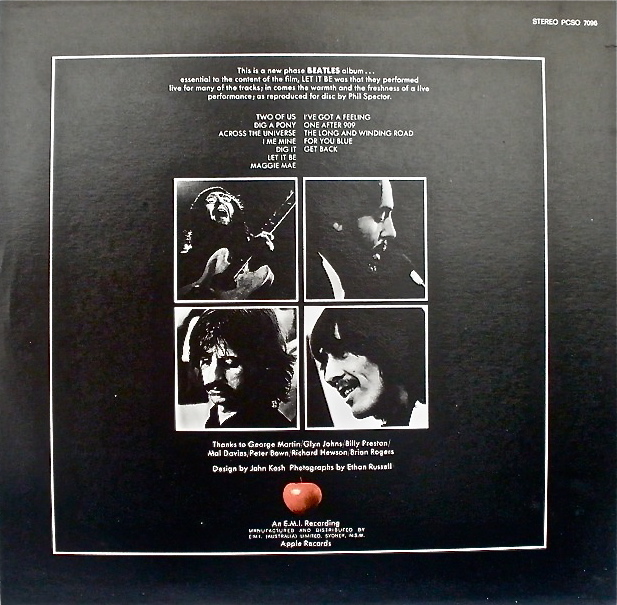 Let It Be was originally intended to be released before Abbey Road during mid-1969 as Get Back, but the Beatles were unhappy with this version, which was mixed and compiled by Glyn Johns, and it was temporarily shelved. 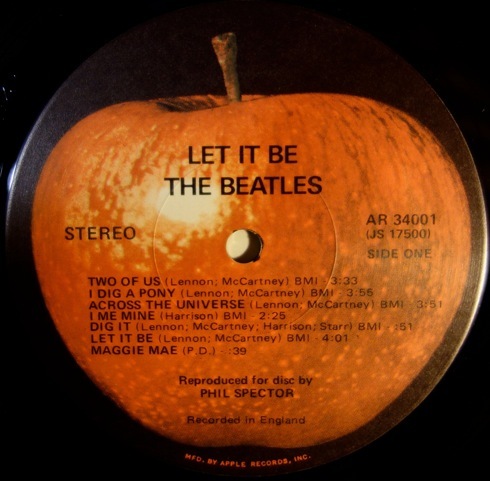 A new version of the album was created by Phil Spector in 1970 and finally released as Let It Be, serving as the soundtrack album for the 1970 motion picture of the same name. 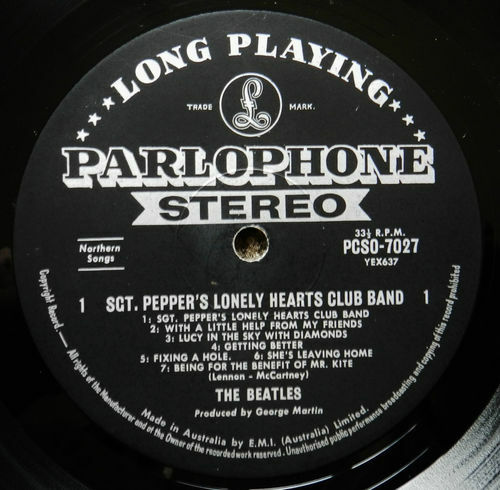 While three songs from the sessions were released as singles before the album’s release, “Get Back”/”Don’t Let Me Down” and “Let It Be”, the songs were remixed by Spector for the album. The rehearsals and recording sessions for the album did not run smoothly. The acrimony that began during the recording of the previous year’s White Album resumed soon after the rehearsals began. 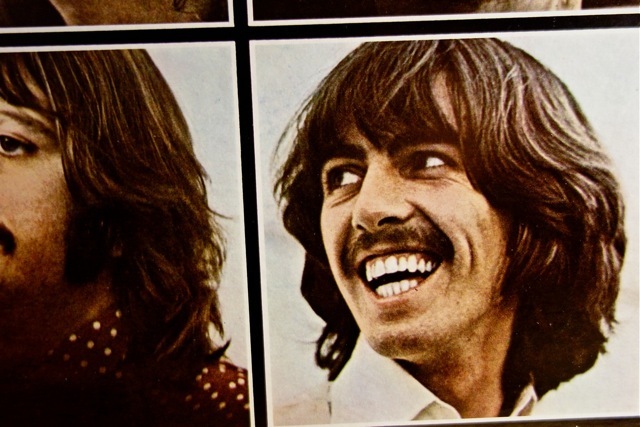 At one point, George Harrison walked out and quit the group after severely arguing with both Paul McCartney and John Lennon, only to be coaxed back some days later. The film version is famous for showcasing a number of conflicts between the group members and has frequently been referred to as a documentary intended to show the making of an album but instead showing “the break-up of a band”. Despite a largely negative review from Rolling Stone magazine at the time of its release, the album was ranked number 86 in the magazine’s list of the 500 greatest albums of all time in 2003. 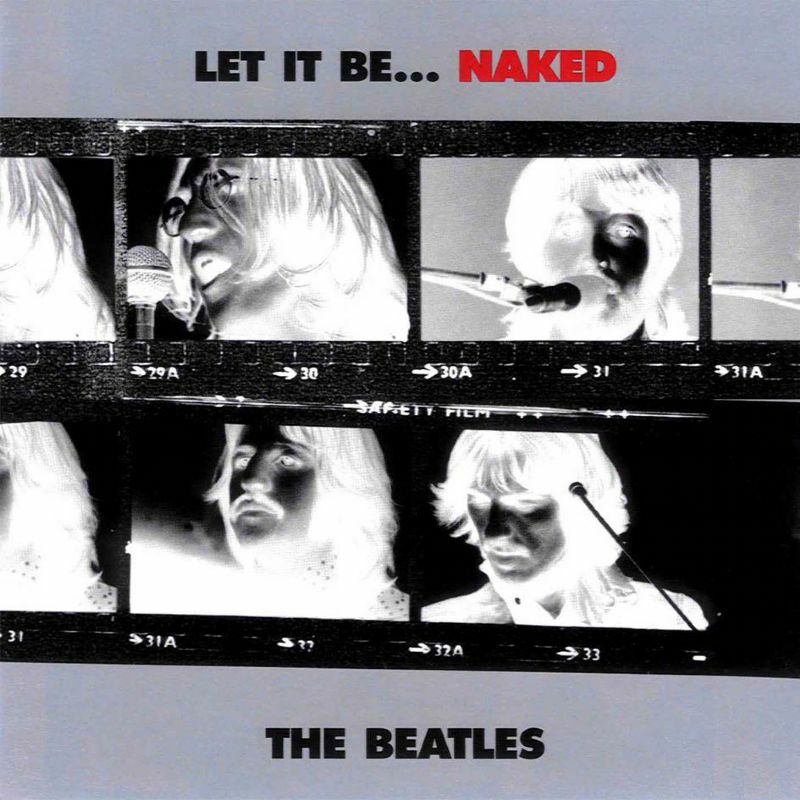 Let It Be… Naked was released in 2003, an alternative version of the album stripping much of Phil Spector’s production work and using some different versions of songs. Forty years ago this weekend, the greatest band of all time gave the world their final album together: On May 8th, 1970, the Beatles released Let It Be, the Phil Spector-produced LP that featured hits like the title track, “The Long and Winding Road” and one of John Lennon’s most famous compositions, “Across the Universe.” While the album was recorded during the band’s caustic final days, Let It Be would go on to become one of their most celebrated records: it ranked Number 86 in Rolling Stone‘s 500 Greatest Albums of All Time. The story behind Let It Be is almost as mythic as the Beatles themselves. 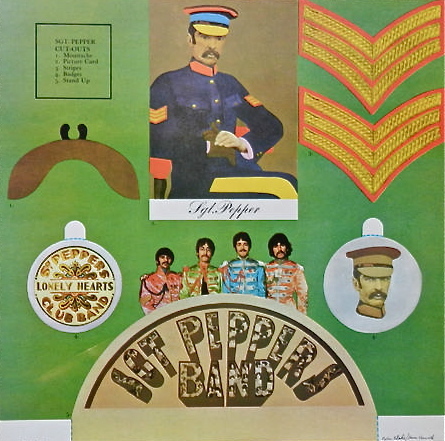 The band originally intended to record it as a live-in-the-studio album and movie in 1969. But the ambitious undertaking left the Beatles so weary, they abandoned the project to make Abbey Road instead. Later, Phil Spector added oversweetened orchestral overdubs to many of the album’s tracks — even though the record features some of the band’s strongest rock songs ever (including “Get Back”). 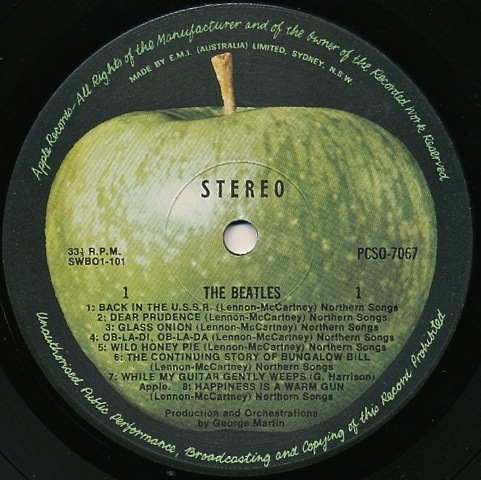 In 1970, the Beatles released the documentary film of the same name, which captured the group’s iconic performance atop the Apple Studios building in January 1969. Perhaps due its controversial and detailed look at the Beatles’ interpersonal problems, the film itself remains unavailable on DVD. 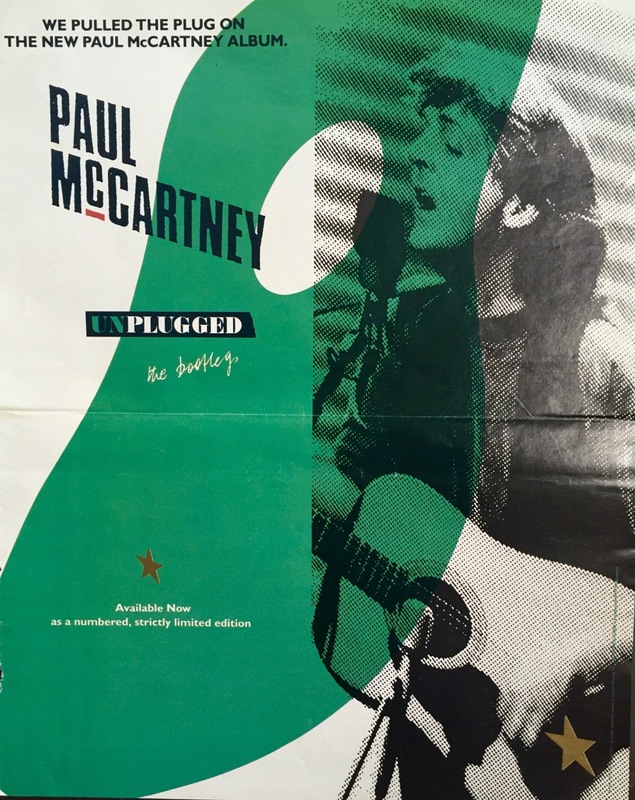 Finally, here’s the sound of “Get Back” in an early incarnation, in rehearsal with John singing lead instead of Paul, and clearly the words to the song are still coming together….